αλλά πάρα ταύτα κάνουν κάθε δυνατή προσπάθεια για να προσθέσουν και άλλα. Greece is a country of 131000 klm2 and 11 million people. But we must also keep in mind two more important facts: It’s a mountainous country, with 10000 villages, 3000 islands –100- inhabited. The islanders are almost 1 million people. The country also welcomes 25 million of tourists every year. Αll of these people and places need energy. 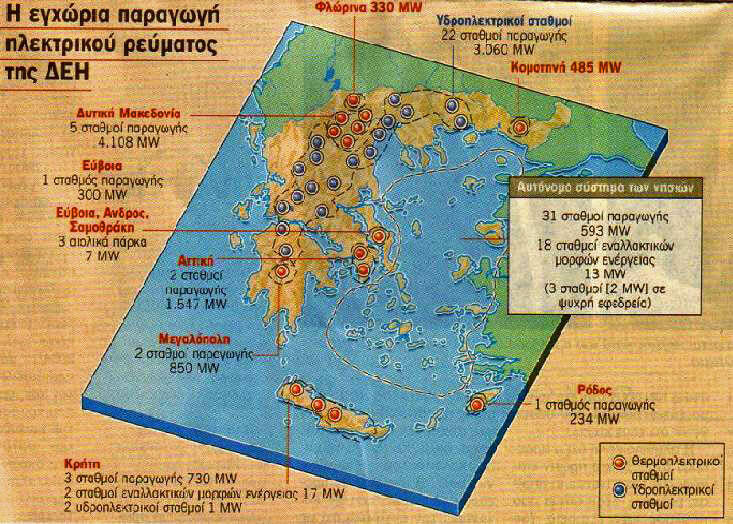 Steady, safe and cheap electric energy over a grid made and regulated through the public company of ΔΕH (DEI). In 2014 the total energy production was 35,3 TWh (2000: 48,5 increased to in 2007: 53.9 and continuously decreasing since then). The grid has to electrify an extremely big and difficult land (mountains and on the same time islands over an almost square side land with 1000 km diagonal). The installed power is 12,8 GW (64% of the country’s total) (in 2010, it was 5,4 in 1980 and only 0,6 in 1960). The flux of energy (installed capacity) is: 30% coal, 15% diesel, 15% natural gas, 20% hydroelectric, 10% renewables and others. According to 2013 data thermal units were10,060 GW, and the other units 7,222 GW. When it comes to production the situation is follows: 55% from coal, 16% from diesel etc, 20% from natural gas and less than 10% from hydroelectric and renewables. So the installed capacity doesn’t mean that the end of fossil fuels production reaches an end. The price is about 41€/MWh. Coal is extremely cheap, there is plenty of it in the country and the reserves are enough for 400 years. Because of economic crisis and memorandums the energy system is in a transition period towards privatization. It is clear that electricity production basically comes from fossil fuels, coal, oil and natural gas. So a great problem of CO2 and other greenhouse gases has to be faced and controlled. There is also a great health impact. Some years ago there was a serious problem evening Athens. Air pollution (SO2, NOx, CO2) and PM were found in the city’s air. The regulations (closing near thermal units, unleaded gasoline etc) have made a progress. But in places like Ptolemaida (north Greece) or Megalopolis (south Greece) the problem is extremely serious, the lifespan is much shorter and cancer and lungs and cardiovascular diseases are increasing (more than double PM2.5 than the rest of the country, around 23 μg/m3) . We must also take into account the obligations of the country because of international treaties and EC regulations for CO2 emissions and climate change. The solution is not easy. If the aim is a better environment, in the year 2030, there must be a shift from a fossil fuels energy production to other safer for humans and the environment methods. But this is going to be very difficult for such a small time period (only 15 years). A 50% reduction of fossil fuels (practically almost 90% comes from fossil fuels nowadays) means that there must be a solution of an increase of not fossil methods to reach the capacity of about 20 TWh per year. The LCOE for natural gas in 2015 was around 19 /MWh. The LCOE for lignite in 2012 was 59,93 €/MWh because the energy density of Greek lignite (brown coal) is around 1.200kcal/kg. Unfortunately there isn’t an administration such as US EIA in Greece and the data comes from many different sources. What can be the solutions? Theoretically nuclear power, wind, solar, hydroelectric, bio-fuels etc. Greece. They believe that this is very dangerous for a small and seismogenic country, with small distances from the probable location of a factory and populated cities etc. Wind farms have been deployed during the last two decades all over the country. The installed capacity is 1558,2 MW. Medium price of wind energy in 2016: 98 €/MWh. Unfortunately with no respect to the landscape, the history, the use of land and the wild beauty of Greek natural environment. They have a great cost for construction and sometimes they are not connected to the grid. It seems that one the main reasons for their deployment is the big subsidies that companies and the owners can take from the state and the EC. Wind farms also sell the electricity 3-4 more expensive from the price of the fossil fuels production. I addition they cause problems to tourism, agriculture and animals breeding. Naturally all of these problems have started a big war against them from environmentally thinking people and the local societies. If we want to keep them we must find really new ways of deploying them. Solar power is almost at the beginning. The installed capacity is 260,67 MW. This is strange enough for a country with very good solar radiation. You can find some PVs over the roofs of houses. But there aren’t serious solar power production facilities. In the case of solar we do not face the problems of wind, like the big land footprint, or the heavy landscape spoiling. And this can be avoided in the future if we do not use important land for the installation of solar PVs. The solar power’s land footprint is one of the lowest. Around 1%. We can use deserted industrial areas and open pits (e.g. coal and other minerals mines, or for marble and stones used in building industry etc.). Following this solution solar power can give the necessary electricity for decreasing the fossil fuels production. With 1% land coverage solar power is able to cover the primary electric energy production of the country. This is less from the almost 1,5-2% of land used for wind farms (already in use but offering only around 3% of the total electric energy production. The price per MWh is almost 3 times bigger than the price from thermal units. This must change. Otherwise the cost of mitigation will stay to expensive for the shift from CO2 correlated energy to clear energy. It is not logical to buy 4 times more expensive solar power in Greece than in Germany. The medium price in 2016 is 257€/MWh. Bio-fuels is not a great idea for this situation. Although there are good results from some research centers (polytechnic and university schools) generally they are expensive and their CO2 emissions are not minimal. One of the important parts of the solution is the improvement in efficiency and efficacy of energy technologies. New lightening technologies, better thermal insulation of houses and big buildings, more public transportation, better and newer cars, bicycles and more walking (also a health exercise on the same moment) must be part of the energy use and the energy planning for the near future. One of the advantages of these solutions is that they are not very expensive. Some of them have no cost, because they are just different ways of living and thinking. And all of them can be applied very fast in short time periods (days, months or just some years). All of these result to Carbon Reduction. Some examples: Driving your car 50% less or carpooling with another person can save ~1000-3000 kg CO2e/yr. Upgrading the lightning technology of a medium sized house can save ~100-300 kg CO2e/yr. More taxes in not going to have good results. The country faces 30% GDP decline and 50% increase in taxes and consumer values. Nobody can pay –or can accept to pay- more money for CO2 reduction. Hydroelectric is already an important factor. But it is difficult to accept the idea of a big increase of its part to the total energy production. The main reason is the fact that there is less water in the country and because of climate change we can not expect a better future situation. Fewer rains and snows, more heat and perspiration makes the water for hydroelectric a valuable asset that is going to be less and as a result you can’t expect to find a CO2 solution to this kind of energy production. Another well known problem is the big land use and landscape alterations that are caused by huge dams etc. The idea of small hydroelectric for islands etc isn’t a serious one. The water problem is more serious there and even under the best perspectives the planning is about 0,5% participation at the final energy sum. These kind of ideas are mainly for political reasons and not for energy reasons. They are for the impression not for the result. But the CO2 reduction (and of the other GHG) needs a really new process, a radical change of the basis of energy production for the country. Taking into account the previous the only really logical solutions, with the best results and prospects, are solar power under a reasonable cost and land use and improvement in efficiency and efficacy. Η απελευθέρωση των αγορών ηλεκτρικής ενέργειας (ΗΕ) και φυσικού αερίου (ΦΑ) στην Ευρώπη ξεκινά από τη δεκαετία του ’90 και συμπίπτει με μια ριζική αλλαγή στην ενεργειακή πολιτική της ΕΕ υπέρ των ΑΠΕ, τη χρήση του ΦΑ για ηλεκτροπαραγωγή, και του διασυνοριακού εμπορίου ενεργειακών αγαθών. Απώτερος στόχος, η δημιουργία μιας κοινής Ευρωπαϊκής αγοράς με ενιαίους κανόνες για όλες τις χώρες μέλη, η οποία θα διέπεται από το πνεύμα του ανταγωνισμού και της ελεύθερης αγοράς. Η τάση προς ιδιωτικοποίηση των ενεργειακών κλάδων στηρίχτηκε από μια σειρά τεχνολογικούς και πολιτικούς παράγοντες. Σε ότι αφορά την τεχνολογία, μειώθηκε το κόστος κατασκευής των απαραίτητων υποδομών ενώ η ανάπτυξη των ΑΠΕ έδωσε τη δυνατότητα υλοποίησης εγκαταστάσεων “διεσπαρμένης παραγωγής”, δηλαδή την κατασκευή πολλών μικρών σταθμών παραγωγής ΗΕ κοντά στα κέντρα κατανάλωσης. Οι μονάδες αυτές, δεν εξαρτώνται από κάποιο ορυκτό καύσιμο, είναι αυτοματοποιημένες, η συντήρηση και η λειτουργία τους χρειάζεται ελάχιστο προσωπικό. Σε ότι αφορά την οικονομία, η συγκέντρωση και συγκεντροποίηση κεφαλαίου στο χρηματοπιστωτικό κλάδο, μείωσε το κόστος δανεισμού για την υλοποίηση επενδύσεων μεγάλης κλίμακας. Σε ότι αφορά το πολιτικό σκέλος, οι ιδιωτικοποιήσεις στο χώρο της ενέργειας συνέπεσαν με την κατάρρευση του υπαρκτού σοσιαλισμού, τη μαζική εισαγωγή Ρωσικού ΦΑ στις βόρειες Ευρωπαϊκές χώρες, την κυριαρχία του φιλελευθερισμού και την κατάργηση των κοινωνικών συμβολαίων. Ιστορικά, η πρώτη ιδιωτικοποίηση στο χώρο της ενέργειας έγινε στα μέσα της δεκαετίας του ‘80 από τη Θάτσερ, σαν απάντηση στην απεργία των ανθρακωρύχων στη Μ. Βρετανία. Η τάση για ιδιωτικοποίηση αποτυπώθηκε στις Ευρωπαϊκές Οδηγίες 1996/92/ΕΚ και 2001/77/ΕΚ για την απελευθέρωση των αγορών ΗΕ και ΦΑ και την Οδηγία 2009/28/ΕΚ για την προώθηση των ΑΠΕ και την αντιμετώπιση της κλιματικής αλλαγής. Οι Οδηγίες αυτές έθεταν ως όρο συμμόρφωσης τη δημιουργία μιας ανταγωνιστικής αγοράς (περισσότεροι του ενός παικτών πέραν του κρατικού μονοπωλίου) καθώς και τον λογιστικό ή και ιδιοκτησιακό διαχωρισμό (unbundling) των καθετοποιημένων επιχειρήσεων που δραστηριοποιούνται σε όλο το φάσμα της ενεργειακής αγοράς (παραγωγή – μεταφορά – διανομή). Σε όλη την ΕΕ, πολιορκητικός κριός της ιδιωτικοποίησης ήταν οι ΑΠΕ. Η Ευρωπαϊκή Επιτροπή Ενέργειας, καθορίζοντας ad hoc το ενεργειακό ισοζύγιο κάθε χώρας και επιβάλλοντας βαριές κυρώσεις σε περίπτωση μη συμμόρφωσης, υπέδειξαν στις εθνικές κυβερνήσεις την οικονομική στήριξη και την με κάθε τρόπο διευκόλυνση επενδύσεων ΑΠΕ (περιβαλλοντικοί όροι, απαλλοτριώσεις κλπ). Για να διευκολύνει τη μετάβαση στην ελεύθερη αγορά ο δημόσιος τομέας αποκλείστηκε – οι επενδύσεις ΑΠΕ πρέπει να είναι ιδιωτικές επενδύσεις και όχι π.χ. ασφαλιστικά ταμεία ή υπηρεσίες κοινής ωφέλειας. Χωρίς την αθρόα χρηματοδότηση από την Ευρωπαϊκή Κεντρική Τράπεζα, τον χαρακτηρισμό των επενδύσεων ως “εθνικής σπουδαιότητας” και, κυρίως, την εισαγωγή των εγγυημένων τιμών (Feed in Tariff – FiT) που θα αναλυθούν παρακάτω, το όραμα της “πράσινης ανάπτυξης” δε θα μπορούσε να γίνει πραγματικότητα. Πρέπει να διευκρινιστεί ότι, τουλάχιστον ως τώρα, η ΕΕ δεν επιβάλει ρητά την πώληση κρατικών επιχειρήσεων αλλά τη δημιουργία μη ρυθμιζόμενων από το κράτος αγορών. Κάθε χώρα μέλος μπορεί να προβεί στις δικές της εθνικές νομοθετικές ρυθμίσεις προκείμενου να δημιουργήσει μια ανταγωνιστική αγορά στο εσωτερικό της. Η ιδιωτικοποίηση έρχεται έμμεσα καθώς τα κρατικά μονοπώλια πρέπει σταδιακά να αφήσουν ελεύθερο χώρο για τα ιδιωτικά κεφάλαια. Βασικό επιχείρημα για τα παραπάνω είναι ότι με την απουσία ανταγωνισμού το κρατικό μονοπώλιο μεταφέρει στο κοινωνικό σύνολο και στον κρατικό προϋπολογισμό “κρυμμένα” κόστη παραγωγής, έχει υψηλό λειτουργικό κόστος και συμβάλλει στη διόγκωση των δημοσιονομικών ελλειμμάτων, εμποδίζει την είσοδο κεφαλαίων στην αγορά, , λειτουργεί με αδιαφάνεια, είναι έρμαιο των συνδικάτων κοκ. Στον αντίποδα των παραπάνω βρίσκεται η αντίληψη ότι η αντιμετώπιση ως εμπορεύματος ενός ζωτικού αγαθού, όπως είναι η ενέργεια, δεν μπορεί παρά να αποτελέσει πεδίο κερδοσκοπίας από πλευράς του κεφαλαίου. Η ιδιωτικοποίηση των δημόσιων επιχειρήσεων ενέργειας σημαίνει εκποίηση δημόσιας περιουσίας και περιορισμό εθνικής κυριαρχίας, συνοδεύεται από οικονομικά σκάνδαλα, μεγάλες ανατιμήσεις εις βάρος του καταναλωτή, συμπίεση των εργατικών δικαιωμάτων και αμοιβών, συμβάλλει στη διόγκωση της οικονομικής ύφεσης με ότι αυτό συνεπάγεται. Σήμερα, στις περισσότερες χώρες της ΕΕ οι εταιρίες ηλεκτρισμού και φυσικού αερίου έχουν στον ένα ή άλλο βαθμό ιδιωτικοποιηθεί είτε μέσω χρηματιστηρίου είτε με άμεση πώληση σε κάποια funds. Σχεδόν 100% ιδιωτικοποιημένη είναι η ενεργειακή αγορά στη Μ. Βρετανία. Στις χώρες του Ευρωπαϊκού Νότου (Ιταλία, Ισπανία, Πορτογαλία και Ελλάδα) οι αντίστοιχες εταιρίες έχουν ιδιωτικοποιηθεί (ή βρίσκονται σε διαδικασία ιδιωτικοποίησης) σε ποσοστό άνω του 50%. Αντίθετα, σε πολλές βόρειες χώρες που διαθέτουν κοιτάσματα ΦΑ και υδροηλεκτρικούς ή πυρηνικούς σταθμούς ηλεκτροπαραγωγής (Σκανδιναβικές χώρες, Γαλλία, Βέλγιο, Ολλανδία και αλλά και σε μεγάλο ποσοστό στη Γερμανία) το Δημόσιο εξακολουθεί να ελέγχει το μεγαλύτερο μέρος των ενεργειακών αγορών. Διάγραμμα 1: παραγωγή ΗΕ ανά τύπο καυσίμου στην ΕΕ, περίοδος 1990 – 2009. Σε πληθώρα μελετών και αναλύσεων εκφράζεται έντονος προβληματισμός για το ενεργειακό μέλλον της ΕΕ καθώς τα επιχειρήματα της “πράσινης ανάπτυξης” φαίνεται να ξεθωριάζουν λόγω της παρατεταμένης οικονομικής ύφεσης στη ζώνη του ευρώ αλλά και τεχνολογικών καινοτομιών όπως η δυνατότητα εξόρυξης πετρελαίου και ΦΑ από σχιστολιθικά πετρώματα στις ΗΠΑ που σηματοδοτούν μια σταθεροποίηση ή και πτώση των τιμών των ορυκτών καυσίμων μέχρι το 20301. Στην Ελλάδα, η απελευθέρωση της αγοράς ΗΕ έγινε σε συμμόρφωση των Ευρωπαϊκών Οδηγιών. Οι ΑΠΕ ήταν ο πολιορκητικός κριός της απελευθέρωσης και μάλιστα με στοιχεία “λαϊκού καπιταλισμού” καθώς, μέχρι και το 2009, ήταν ενταγμένες στους αναπτυξιακούς νόμους και στηρίχτηκαν σε δημόσιες επιχορηγήσεις ιδιωτικών επενδύσεων, σε ποσοστό μέχρι και 40%. Το νομοθετικό πλαίσιο ήταν δαιδαλώδες (Ν. 2244/94, Ν. 2773/99, Ν. 3851/2010 γνωστός και ως νόμος Μπιρμπίλη, Ν. 4001/2011), μεταβάλλονταν συνέχεια υπέρ των επενδυτών και εις βάρος της ΔΕΗ Α.Ε. και εξαρχής ήταν προσανατολισμένο στην εξασφάλιση των επενδύσεων και της κερδοφορίας των ιδιωτικών κεφαλαίων. Παρόλα αυτά, μέχρι την εκδήλωση της οικονομικής κρίσης, η ιδιωτικοποίηση της ΔΕΗ ΔΕΝ ήταν στην ατζέντα των κυβερνήσεων Σημίτη – Καραμανλή. Αυτό οφείλεται, ίσως, στο ότι οι κυβερνήσεις είχαν κάποια επίγνωση της πραγματικά στρατηγικής σημασίας που παίζει η ΗΕ για τη χώρα. Αφετέρου, όπως θα αναλυθεί και στη συνέχεια, το όλο σύστημα βασίζονταν τόσο στο δανεισμό – με κρατική εγγύηση – της ΔΕΗ Α.Ε. (που κάλυπτε τις “τρύπες” που δημιουργούσε η λειτουργία της αγοράς) όσο και στη διαρκή ανατίμηση των τιμολογίων λιανικής. Νέα “ενεργειακά” τζάκια εμφανίστηκαν με την ισχυροποίηση κατασκευαστικών ομίλων, την είσοδο πολυεθνικών κολοσσών και τον αθρόο δανεισμό από τις ελληνικές και ξένες τράπεζες. Η τιμή λιανικής καθορίζονταν από το Υπουργείο Οικονομικών. Από την 1η Ιουλίου 2013 το κόστος ηλεκτροπαραγωγής (χονδρική) έχει μεταφερθεί πλήρως στους καταναλωτές (λιανική). Όσο η ΔΕΗ Α.Ε. διαθέτει πλούσιο ενεργειακό μίγμα (μονοπώλιο στα κοιτάσματα λιγνίτη και στους μεγάλους υδροηλεκτρικούς σταθμούς – ΥΗΣ) κανείς ιδιώτης δεν μπορεί να παράγει ενέργεια σε πραγματικά ανταγωνιστικές τιμές. Η ιδιωτικοποίηση της ΔΕΗ Α.Ε. τέθηκε ως βασικός όρος στο Επικαιροποιημένο Πρόγραμμα του Μνημονίου (Αύγουστος 2010). Με το ΦΕΚ Α168/24-07-2013 η πώληση τουλάχιστον του 30% της ΔΕΗ Α.Ε. και του 66% του δικτύου μεταφοράς (ΑΔΜΗΕ Α.Ε.) έγινε νόμος του κράτους. Τα χρονοδιαγράμματα που προβλέπονται είναι ασφυκτικά και η πώληση πρέπει να έχει ολοκληρωθεί μέχρι το 2014. Η απορρύθμιση της Ελληνικής αγοράς ηλεκτρισμού την περίοδο 2001 – 2012 και η μαζική είσοδος επενδυτών άλλαξε ριζικά το ηλεκτρικό ενεργειακό ισοζύγιο της χώρας. Η εγκατεστημένη ισχύς των μονάδων ηλεκτροπαραγωγής στο διασυνδεδεμένο σύστημα (πλην νησιών) για το 2012 δίνεται στον Πίνακα 2 ενώ το Διάγραμμα 2 δίνει μια σύγκριση του ενεργειακού μίγματος (σε ποσοστό %) που χρησιμοποιήθηκε για ηλεκτροπαραγωγή για τα έτη 2004 και 2012. Σε ότι αφορά τις μονάδες ηλεκτροπαραγωγής του Πίνακα 2, το σύνολο των λιγνιτικών και υδροηλεκτρικών σταθμών ανήκει ακόμα στη ΔΕΗ Α.Ε. Σε μεγάλες κοινοπραξίες Ελληνικών και πολυεθνικών επιχειρηματικών ομίλων ανήκει το σύνολο σχεδόν των σταθμών ΑΠΕ (ΓEK ΤΕΡΝΑ Α.Ε. – Gaz De France Suez, Ρόκας – Ibedrola, Όμιλος ΕΛ.ΠΕ. – EDISONItaly) και περισσότερο από το 50% της εγκατεστημένης ισχύος σταθμών ΦΑ, (ΓEK ΤΕΡΝΑ Α.Ε., ΑΚΤΩΡ – Μπόμπολας, Όμιλος ΕΛ.ΠΕ. – EDISONItaly, ΕΝΕL Ιταλία – Κοπελούζος, EdF France κλπ ). Το ΦΑ που εισάγεται στην Ελλάδα, έχει την υψηλότερη τιμή σε όλη την ΕΕ και μια από τις υψηλότερες τιμές σε όλο τον κόσμο, παράμετρος που από την πρώτη στιγμή έκανε προβληματική τη βιωσιμότητά τους (13,27 €/GJ σε σύγκριση με τα 10,55 €/GJ που είναι ο μέσος όρος της ευρωζώνης2). Συγκρίνοντας τον Πίνακα 2 (ισχύς) και το Διάγραμμα 1 (ενέργεια), διαπιστώνεται μια δραστική μείωση της λιγνιτικής παραγωγής προς όφελος της ηλεκτροπαραγωγής από ΑΠΕ και ΦΑ για την περίοδο 2004-2012. Εντούτοις, παρά την αύξηση της ισχύος μονάδων ΦΑ (29% του συνόλου το 2012), η συνεισφορά του ΦΑ στην παραχθείσα ενέργεια είναι μόλις 27%. Οι λιγνιτικές μονάδες (28% της συνολικής ισχύος) παράγουν το 52% της ενέργειας. Αυτό οφείλεται στο πολύ υψηλό κόστος λειτουργίας των μονάδων ΦΑ (~100€/MWh) σε σχέση με τις λιγνιτικές μονάδες (40-50€/MWh). Οι ΑΠΕ αν και αποτελούν το 20% της εγκατεστημένης ισχύος της χώρας, παράγουν μόλις το 10% της ενέργειας που καταναλώνεται. Αυτό οφείλεται στο χαμηλό βαθμό αξιοπιστίας των ΑΠΕ, λόγω του στοχαστικού χαρακτήρα του ήλιου και του ανέμου. Tο Μάρτιο του 2013, η συνολική ισχύς ΑΠΕ σε λειτουργία (με συμβόλαιο αγοραπωλησίας) ήταν 3.463 MW, υπό σύνδεση (με συμβόλαιο αγοραπωλησίας) ήταν άλλα 2.282 MW ενώ η συνολική ισχύς ΑΠΕ (εγκαταστάσεις σε λειτουργία, υπό σύνδεση και σε πρώιμο στάδιο) φτάνει τα 32.527 MW! Το νούμερο αυτό είναι εξωπραγματικό για τις ανάγκες της χώρας και φανερώνει τoν πρόχειρο και τυχοδιωκτικό χαρακτήρα της αγοράς – φούσκας που έχει δημιουργηθεί. Διάγραμμα 2: Ανάλυση του ενεργειακού μίγματος (%) ανά κατηγορία καυσίμου που χρησιμοποιήθηκε για παραγωγή ΗΕ τα έτη 2004 και 2012. Τη ίδια στιγμή, ενώ το ενεργειακό ισοζύγιο της χώρας άλλαζε ριζικά και η εγκατεστημένη ισχύς παραγωγής αυξήθηκε, η οικονομική ύφεση μείωσε τη συνολική ζήτηση. Στο Διάγραμμα 3 (συνεχής γραμμή) αποτυπώνεται η ζήτηση ΗΕ σε TWh στην Ελλάδα τα τελευταία χρόνια. Είναι σαφής μια απότομη πτώση από το 2008 και μετά. Για το 2012 καταγράφεται μια ζήτηση της τάξεως των 54 TWh, με πτώση της τάξεως του 8% σε σχέση με τις περίπου 58,5 TWh του 2008, που δείχνει το βάθος της ύφεσης στον πρωτογενή και δευτερογενή τομέα (παραγωγικό κεφάλαιο ή “πραγματική” οικονομία). Η τάση αυτή συνεχίζει να είναι πτωτική και για το 2013. Για τα έτη 2012 και 2013, η πραγματική αιχμή του συστήματος δεν ξεπέρασε τα 9.500 MW, σε σύγκριση με τα 15.700 MW της διαθέσιμης εγκατεστημένης ισχύος. Σύμφωνα με στοιχεία του ΥΠΕΚΑ (“Εθνικός Ενεργειακός Σχεδιασμός – Οδικός Χάρτης για το 2050”, Μάρτιος 2012) o “εκσυγχρονισμός” του ενεργειακού μείγματος με την κατασκευή νέων σταθμών ΦΑ και την εισαγωγή των ΑΠΕ κόστισε πάνω από €15 δις μέσα σε 10 χρόνια. Τα επιτόκια δανεισμού των επενδύσεων αυτών κυμαίνονταν από 8-11% (οι επενδύσεις σε ενεργειακά έργα θεωρούνται ιδιαίτερα επισφαλείς) με ρήτρες απόσβεσης εντός δεκαετίας. Οι επισφάλειες αυτές, καλύφθηκαν από την κατακόρυφη αύξηση της τιμής της ΗΕ Και, όπως θα φανεί στη συνέχεια, από το δανεισμό της κρατικά ελεγχόμενης ΔΕΗ Α.Ε. Η ενεργειακή εξάρτηση της χώρας αυξήθηκε είτε άμεσα (χρήση ΦΑ) είτε έμμεσα (σχεδόν αποκλειστικά εισαγόμενος εξοπλισμός ΑΠΕ υψηλής τεχνολογίας, με μηδαμινή μεταφορά τεχνογνωσίας και δημιουργία ελάχιστων σταθερών θέσεων εργασίας). Προκάλεσε μια υδροκέφαλη αγορά ΗΕ με υπερβάλλουσα εγκατεστημένη ισχύ και ταυτόχρονη σταθερή μείωση της ζήτησης και των ετήσιων πωλήσεων. Κόστισε περίπου €15 δις με υψηλά επιτόκια δανεισμού, ο οποίος πρέπει να αποσβεστεί. Επέβαλε τη λειτουργία μονάδων ΦΑ με εισαγόμενο ενεργειακό καύσιμο και υψηλό λειτουργικό κόστος. Ο όποιος ενεργειακός σχεδιασμός αποδείχτηκε λανθασμένος και εξωπραγματικός για τα δεδομένα της χώρας. Μια παράμετρος που δεν έχει αναλυθεί, είναι τα έμμεσα κόστη που δημιουργεί η λειτουργία της αγοράς, πέρα από το κόστος του εξοπλισμού και εισαγωγής του καυσίμου. Κόστη που σε μεγάλο βαθμό θα ήταν ανύπαρκτα σε συνθήκες φυσικού μονοπωλίου. Μια επιπλέον ιδιαιτερότητα της Ελληνικής αγοράς είναι η σχεδόν απόλυτη κυριαρχία της ΔΕΗ Α.Ε. στο χώρο της προμήθειας (λιανικό εμπόριο), μετά τη χρεοκοπία και το γνωστό σκάνδαλο των παρόχων Hellas Power και Energa. Όπως φαίνεται στο Διάγραμμα 4, αν στη λιανική αγορά υπάρχει αδυναμία πληρωμής των τιμολογίων, η ΔΕΗ Α.Ε. είναι υποχρεωμένη να καλύπτει το έλλειμμα της αγοράς. Μόνο τα τελευταία χρόνια η ΔΕΗ Α.Ε. έχει δανειστεί περισσότερο από €1,0δις, μεγάλο μέρος του οποίου κατευθύνθηκε στην την τόνωση των αγορών και την αποπληρωμή των παραγωγών ΑΠΕ 4. Η βραχυχρόνια αγορά ενέργειας (Ημερήσιος Ενεργειακός Προγραμματισμός – ΗΕΠ), καθορίζει την Οριακή Τιμή Συστήματος (ΟΤΣ σε €/ΜWh). Η ΟΤΣ είναι το “νόμισμα” με το οποίο συναλλάσσονται όλοι οι εμπλεκόμενοι στην αγορά (παραγωγοί από συμβατικούς σταθμούς, προμηθευτές και έμποροι) και εκφράζει το συνολικό κόστος λειτουργίας της αγοράς (προμήθεια καυσίμων και λειτουργικά κόστη. Οι παραγωγοί ΑΠΕ αποζημιώνονται σε υψηλότερες τιμές, με το σύστημα εγγυημένων τιμών. Χωρίς να γίνει επέκταση σε πολλές λεπτομέρειες, καθοριστικό ρόλο στη διαμόρφωση της ΟΤΣ παίζει η σειρά με την οποία εντάσσονται οι μονάδες ανάλογα με το λειτουργικό (μεταβλητό) τους κόστος. Οι ΑΠΕ, οι φθηνότερες συμβατικές μονάδες (λιγνιτικές) και οι μονάδες με υποχρεωτική λειτουργία σε τεχνικά ελάχιστη παραγωγή εντάσσονται κατά προτεραιότητα. Η πολύ μεγάλη διείσδυση των ΑΠΕ και η μείωση της ζήτησης, οδήγησε στο φαινόμενο να καλύπτεται σχεδόν πλήρως το φορτίο από τις ΑΠΕ και τις μονάδες που λειτουργούν σε τεχνικά ελάχιστα. Έτσι, η ΟΤΣ διαρκώς μειώνεται ενώ οι προσφορές των ιδιωτικών μονάδων ΦΑ (κόστος ~100€/ΜWh) απορρίπτονται από το μοντέλο αγοράς. Αν και σύμφωνα με τους “νόμους της αγοράς” θα έπρεπε να αφεθούν να χρεοκοπήσουν, με αποφάσεις της ΡΑΕ θεσμοθετήθηκε η υποχρεωτική κατανομή του 30% της παραγωγής από μονάδες ΦΑ και μάλιστα σε τιμή +10% του λειτουργικού κόστους. Έτσι, οι ιδιώτες παραγωγοί εξασφάλισαν ένα σταθερό και εγγυημένο κέρδος! Το σύστημα αυτό εφαρμόστηκε και εξακολουθεί να εφαρμόζεται με διάφορες μορφές σε όλες τις χώρες της ΕΕ. Σύμφωνα με το σύστημα των εγγυημένων τιμών (FiT) η παραγωγή των ΑΠΕ αγοράζεται υποχρεωτικά από το ΛΑΓΗΕ Α.Ε. σε σταθερές τιμές και με μακροχρόνια συμβόλαια αγοραπωλησίας (10-20 χρόνια). Στον Πίνακα 3, δίνονται οι εγγυημένες τιμές ΑΠΕ σε χώρες της ΕΕ για το έτος 2010, πριν την κορύφωση της οικονομικής κρίσης. Η πριμοδότηση των ΑΠΕ είχε ενιαία χαρακτηριστικά σε όλες σχεδόν τις χώρες της ΕΕ. Οι τιμές είναι περίπου συγκρίσιμες και δε λαμβάνουν υπόψη το διαφορετικό βαθμό οικονομικής ανάπτυξης ούτε το διαφορετικό δυναμικό ΑΠΕ κάθε χώρας. Για παράδειγμα, το 2010 η μέγιστη τιμή ΗΕ από Φ/Β στη Γερμανία είναι ίση με τη μέση τιμή στην Ελλάδα, αν και η Γερμανική οικονομία είναι πολλαπλάσια της Ελληνικής ενώ ο βαθμός ηλιοφάνειας στη χώρα μας είναι πολύ μεγαλύτερος από τη Γερμανία. Έτσι, π.χ. για τους Φ/Β σταθμούς στην Ελλάδα η αποζημίωση έφτανε τα 0,55€/kWh (550€/MWh) ενώ για τα Α/Π ήταν ~90€/MWh – δεκαπλάσια και διπλάσια, αντίστοιχα, από ότι το κόστος λειτουργίας ενός λιγνιτικού σταθμού (~50€/MWh)! Σαν αποτέλεσμα της οικονομικής κρίσης (αλλά και της σταδιακής χρεοκοπίας των αγορών ΗΕ στις περισσότερες χώρες της ΕΕ), οι εγγυημένες τιμές του Πίνακα 5 αναπροσαρμόστηκαν προς τα κάτω τα τελευταία χρόνια σε όλες τις χώρες ενώ επιβλήθηκαν περιορισμοί στην απορρόφηση και τη δημιουργία νέων σταθμών ΑΠΕ. Ο περιορισμός στη διείσδυση των ΑΠΕ δεν προήλθε από κάποιο “αυτοματισμό” λόγω κορεσμού της αγοράς αλλά ήταν κεντρική πολιτική απόφαση. Η αγορά ΑΠΕ όσο απότομα ανδρώθηκε άλλο τόσο απότομα φαίνεται να ξεφουσκώνει σε όλη την ΕΕ. Ο τρόπος λειτουργίας της αγοράς ΗΕ στην Ελλάδα έχει δημιουργήσει μια κατάσταση ασφυξίας στον (100% δημόσιο) ΛΑΓΗΕ Α.Ε.. Η ασφυξία αυτή μεταφράζεται σε ένα διαρκώς διογκούμενο έλλειμμα της χονδρεμπορικής αγοράς το οποίο κυβέρνηση και τρόικα προσπαθούν να αντιμετωπίσουν με διαρκείς ανατιμήσεις του ηλεκτρικού ρεύματος. Το έλλειμμα αυτό, δημιουργείται από την ίδια τη λειτουργία της χονδρεμπορικής αγοράς και δημιουργείται με τον ακόλουθο τρόπο: Το σύνολο της παραγωγής ΑΠΕ εντάσσεται κατά προτεραιότητα στο πρόγραμμα της ημερήσιας κατανομής των μονάδων παραγωγής, με μηδενική τιμή προσφοράς. Η ΟΤΣ μειώνεται και η λειτουργία των συμβατικών μονάδων (που αποζημιώνονται με την ΟΤΣ) εμφανίζεται ζημιογόνα. Παράλληλα, επειδή η αποζημίωση των παραγωγών ΑΠΕ γίνεται με τις κατά πολύ υψηλότερες εγγυημένες τιμές το ισοζύγιο του ΛΑΓΗΕ εμφανίζεται διαρκώς ελλειμματικό. Για την αντιμετώπιση του ελλείμματος αυτού, ο Ν. 4001/2011 ενεργοποίησε τον “Ειδικό Διαχειριστικό Λογαριασμό ΑΠΕ και ΣΗΘΥΑ”, τα έσοδα του οποίου μετακυλίονται στους καταναλωτές και προέρχονται από διάφορες πηγές κρατήσεων (Ειδικό Τέλος Μείωσης Εκπομπών Αερίων Ρύπων – ΕΤΜΕΑΡ (πρώην “Τέλος ΑΠΕ”), Ειδικό Τέλος Λιγνίτη, Δικαιώματα Εκπομπής Αερίων Θερμοκηπίου, και το 25 % του τέλος υπέρ ΕΡΤ. Έτσι, το κόστος αποζημίωσης των ΑΠΕ που μετακυλίεται στον τελικό καταναλωτή αυξήθηκε από 5,99 το 2011 σε 14,93 €/MWh τον Αύγουστο του 2013, μια αύξηση 249 % ! Παράλληλα επιβλήθηκε Έκτακτη Εισφορά και στους παραγωγούς ΑΠΕ. Παρά τα μέτρα αυτά, όμως, το έλλειμμα του ΛΑΓΗΕ συνεχίζει να διευρύνεται και αναμένεται να φτάσει τα €695 εκ. το Δεκέμβριο του 2014 (ΛΑΓΗΕ Α.Ε. “Μηνιαίο Δελτίο Ειδικού Λογαριασμού ΑΠΕ Αύγουστος 2013”). Αν όμως συνεχιστεί να αυξάνεται με τους ίδιους ρυθμούς η αδυναμία πληρωμής των λογαριασμών από τους καταναλωτές, εκτιμάται ότι θα ξεπεράσει το € 1,0 δις. Περί τα €15 δις σε επενδύσεις μονάδων ΦΑ και ΑΠΕ. Σε αυτά θα πρέπει να προστεθούν το κόστος για την εξυπηρέτηση του δανεισμού που κυμαίνεται σε 8-11% το χρόνο. Στο παραπάνω ποσό θα συμπεριληφθεί και το κόστος κατασκευής ηλεκτρικών δικτύων για τη σύνδεση των παραγωγών ΑΠΕ. Σύμφωνα με μελέτες της ΡΑΕ («Ανάλυση Κόστους Σύνδεσης Αιολικών Πάρκων στο ΕΔΣΜ», Ιανουάριος 2012 και «Ανάλυση Κόστους Σύνδεσης Φωτοβολταϊκών Σταθμών στο ΕΔΣΜ και σε τοπικά δίκτυα ΜΤ», Μάρτιος 2012) το ποσό αυτό εκτιμάται σε € 200εκ. Τα φιλόδοξα προγραμματιζόμενα έργα για τη διασύνδεση των νησιών (Κρήτη, Κυκλάδες, Νησιά του Β.Α. Αιγάιου) ξεπερνούν τα € 3,0 δις για την επόμενη δεκαετία. Τέλος, στα παραπάνω κόστη θα πρέπει να προστεθούν και τα κόστη λειτουργίας της αγοράς. Αυγούστου 2013. Στον Πίνακα 5 δίνεται το κόστος των άλλων μηχανισμών αγοράς – πλην της εκκαθάρισης. Το σύνολο του κόστους λειτουργίας αγοράς ανέρχεται σε € 4.683,08 εκ. για την παραγωγή περίπου 50.300 GWh. Το 35,25% του κόστους αφορά την αποζημίωση των ΑΠΕ ενώ άλλο ένα 26,77% αφορά τη φορολογία και επιμέρους λειτουργίες της αγοράς. Συνολικά, οι μηχανισμοί της αγοράς που έμμεσα επιδοτούν τις ιδιωτικές επενδύσεις αφορούν το 23,48%. Αν σε αυτά προστεθούν και οι εγγυημένες τιμές των ΑΠΕ, το σύνολο της επιδότησης φτάνει το 58,73% ! Το μεγαλύτερο μέρος αυτού του κόστους δεν θα υπήρχε σε συνθήκες κρατικού μονοπωλίου: μια καθετοποιημένη δημόσια επιχείρηση δε θα χρειάζονταν να εισάγει μηχανισμούς εξασφάλισης διαθεσιμότητας ισχύος, και μάλιστα για μονάδες που έχουν αποσβέσει το δανεικό τους κόστος, ούτε να πριμοδοτεί μονάδες ΦΑ προκειμένου να τις εντάξει στο πρόγραμμα κατανομής, Σε ότι αφορά τις ΑΠΕ, μια ορθολογική εισαγωγή τους στο ενεργειακό ισοζύγιο θα μείωνε κατά πολύ το κόστος τους. Βασικός στόχος της Ευρωπαϊκής Οδηγίας 2009/72/ΕΚ είναι η διαμόρφωση ενός ενιαίου τρόπου λειτουργίας των αγορών ηλεκτρικής ενέργειας στις χώρες μέλη της ΕΕ, που περιγράφεται ως Ενιαίο Μοντέλο Ευρωπαϊκής Αγοράς Ηλεκτρισμού (Target Model & European Price Coupling – EPC) και θα αρχίσει να εφαρμόζεται από την 01-01-2015. Στο Ενιαίο Μοντέλο Αγοράς, η δημοπράτηση συναλλαγών ηλεκτρικής ενέργειας ανάμεσα σε οποιεσδήποτε χώρες της ΕΕ θα είναι ελεύθερη ενώ η διενέργεια των συναλλαγών θα γίνεται μέσω ενός Ευρωπαϊκού Χρηματιστηρίου Ενέργειας, με έδρα το Λουξεμβούργο. Στα πλαίσια του Ενιαίου Μοντέλου Αγοράς, τα Ευρωπαϊκά δίκτυα έχουν διαχωριστεί σε επτά περιφέρειες ηλεκτρικής ενέργειας (ζώνες) με την Ελλάδα να ανήκει στην περιφερειακή αγορά της Κεντρικής – Νότιας Ευρώπης (CSE), Διάγραμμα 5. Προϋπόθεση για τη λειτουργία του μοντέλου αυτού, είναι η δραστηριοποίηση επενδυτών στο χώρο της προμήθειας (διανομή) που σήμερα μονοπωλείται από τη ΔΕΗ Α.Ε. Το Νοέμβριο του 2012, η ΡΑΕ κλήθηκε να εξειδικεύσει σε μια σειρά προτάσεις και μέτρα όλα όσα προβλέπεται στο επικαιροποιημένο μνημόνιο (Αύγουστος 2012) και αφορούν την προετοιμασία της αγοράς για την ένταξη στο Ενιαίο Μοντέλο Ευρωπαϊκής Αγοράς Ηλεκτρισμού. Η έκθεση της ΡΑΕ είναι αποκαλυπτική. Σε ένα περιβάλλον κατάρρευσης της αγοράς, παραδέχεται ότι μόνο οι καθετοποιημένες επιχειρήσεις ηλεκτρισμού μπορούν να προσφέρουν το ενεργειακό προϊόν σε πραγματικά ανταγωνιστικές τιμές (sic) και αναγνωρίζει τον καθοριστικό ρόλο της ΔΕΗ Α.Ε. στη διατήρηση χαμηλής τιμής της ΗΕ λόγω του ενεργειακού μίγματος που χρησιμοποιεί (λιγνίτης και υδροηλεκτρικά). Καθοριστικός παράγοντας στην αποτυχία του υφιστάμενου μοντέλου είναι το γεγονός ότι αν και η λειτουργία του mandatory pool έχει οδηγήσει σε αρκετά σημαντικές επενδύσεις στο στάδιο της ηλεκτροπαραγωγής, οι επενδυτές δεν έχουν κίνητρο να δραστηριοποιηθούν στην προμήθεια γιατί έχουν εξασφαλισμένα κέρδη από τον τρόπο που λειτουργεί η αγορά … Η ίδια η ΡΑΕ σημειώνει ότι μηχανισμοί (που η ίδια δημιούργησε) καθώς και το σύστημα των εγγυημένων τιμών και ο πλήρης ανορθολογισμός της αγοράς ΑΠΕ λειτουργούν αποτρεπτικά στη δραστηριοποίηση των ιδιωτών παραγωγών στην προμήθεια5. Αναγνωρίζοντας ότι το σημερινό μοντέλο αγοράς έχει καταρρεύσει, η ΡΑΕ εισηγήθηκε την δημιουργία εικονικών (Virtual) καθετοποιημένων επιχειρήσεων ηλεκτρισμού που θα δραστηριοποιούνται στην παραγωγή και στην προμήθεια ΗΕ. Συνοπτικά, το σχέδιο αυτό προβλέπει τη απευθείας πώληση ενεργειακού μίγματος χαμηλού κόστους από τη ΔΕΗ σε ιδιώτες προμηθευτές. Αν και δε θίγει το ιδιοκτησιακό καθεστώς της ΔΕΗ Α.Ε., η ΡΑΕ τονίζει ότι το σχέδιο αναδιοργάνωσης της αγοράς που προτείνει δεν έρχεται σε αντίθεση με τα σχέδια της κυβέρνησης και της τρόικας για πώληση της ΔΕΗ Α.Ε. Απάντηση στο ιδιοκτησιακό καθεστώς της ΔΕΗ έδωσε απευθείας η τρόικα που επέβαλε την απευθείας πώληση του 30% της εγκατεστημένης ισχύος των σταθμών παραγωγής της ΔΕΗ Α.Ε. Οι λεπτομέρειες θα καθοριστούν μετά από διαβούλευση με την Ευρωπαϊκή Επιτροπή ενέργειας, υπολογίζεται ωστόσο να πωληθούν 1400 MW λιγνιτικών, 500 MW υδροηλεκτρικών και 500 MW μονάδων ΦΑ. Πέρα από αυτό, η τρόικα επέβαλε και την πώληση του συστήματος μεταφοράς (ΑΔΜΗΕ Α.Ε.) σε ποσοστό που κυμαίνεται από 60 ως 100%. Με βάση πρόσφατη ανάλυση της Goldman Sachs (Αύγουστος 2013), η αξία της ΔΕΗ, υπολογίζεται σε €2,3 δισ. Για την εξαγωγή του ποσού αυτού λαμβάνει υπόψη την αξία λειτουργικών δραστηριοτήτων (παραγωγή λιγνίτη, παραγωγή, μεταφορά, διανομή, προμήθεια) σε €7,71 δις και αφαιρεί €4,91 δις. ευρώ που αντιστοιχούν στο χρέος και € 488 εκ. για υποχρεώσεις για τα ασφαλιστικά ταμεία και έναντι της περιβαλλοντικής νομοθεσίας (ανάπλαση ορυχείων κλπ). Πρακτικά, αυτό σημαίνει ότι το τίμημα που θα καταβάλει ο δυνητικός αγοραστής είναι κυριολεκτικά ψίχουλα. Ακόμα και την περίοδο αυτής της βαθιάς ύφεσης οι μόνες σοβαρές επενδύσεις, έγιναν από κρατικά ελεγχόμενες επιχειρήσεις, Πίνακας 6. Η ΔΕΗ, την τριετία της κρίσης και της ύφεσης, επένδυσε €2,95 δις. Ο ΑΔΜΗΕ (ΔΕΗ-Μεταφορά ως το 2011) επένδυσε €253 εκ. Ο ΔΕΣΦΑ, θυγατρική του Ομίλου ΔΕΠΑ, που πουλήθηκε στην Αζέρικη SOCAR για €305 εκ., επένδυσε την ίδια περίοδο για την ανάπτυξη των αγωγών φ.α. 310 εκ.€. Ακόμα και σε συνθήκες βαθιάς ύφεσης, οι μόνες – πολυπόθητες – επενδύσεις προέρχονται από τον υπό εκποίηση δημόσιο τομέα. Μόνο η επένδυση της ΔΕΗ Α.Ε. στην κατασκευή της λιγνιτικής μονάδας Πτολεμαΐδα 5 εντός της επόμενης πενταετίας, ανέρχεται στα €1,6 δις 6. Στην ετήσια μελέτη της ICAP για τις πλέον κερδοφόρες επιχειρίσεις του 2013, η ΔΕΗ Α.Ε. παρά την ύφεση και τα προβλήματα της αγοράς ΗΕ έλαβε τη δεύτερη θέση με αύξηση κερδών προ φόρων ( EBITDA) +52,2%. Η ΔΕΗ θα εκποιηθεί σε εξευτελιστική αξία. Η ηλεκτρική ενέργεια παύει να τελεί υπό τον έλεγχο του κράτους, περνά στον έλεγχο των Ευρωπαϊκών Χρηματιστηρίων και μετατρέπεται από ανεκτίμητο κοινωνικό αγαθό σε απλό χρηματιστηριακό εμπόρευμα. Οι προτεραιότητες ανάπτυξης των δικτύων σταματούν να εξυπηρετούν τους σκοπούς ενός εθνικού ενεργειακού σχεδιασμού, καθορίζονται πλέον από τις χρηματιστηριακές αγορές και προσανατολίζονται στη διευκόλυνση του διασυνοριακού εμπορίου. Το Ευρωπαϊκό Ενιαίο Μοντέλο Αγοράς, πέρα από την απώλεια κάθε έννοιας εθνικής κυριαρχίας που συνεπάγεται, θα οδηγήσει στη σταδιακή σύγκλιση των τιμών ηλεκτρισμού. Σε μια οικονομία που παραπαίει η ΔΕΗ Α.Ε. παρά τις απανωτές αυξήσεις, εξακολουθεί να διαθέτει ενέργεια σε τιμές στο 60-70% του μέσου όρου στην ευρωζώνη, Διάγραμμα 6. Τη στιγμή που πάνω από 500.000 νοικοκυριά έχουν μείνει χωρίς ρεύμα και ενεργοβόρες βιομηχανίες κλείνουν ή σκέφτονται να μετακομίσουν στο εξωτερικό, υπάρχει ορατός ο κίνδυνος διαμόρφωσης συνθηκών ενεργειακής πενίας. Η Ελλάδα μετατρέπεται σε υποανάπτυκτη χώρα. Στη σημερινή συγκυρία διαφαίνονται σοβαροί κίνδυνοι για τη δυνατότητα πρόσβασης των λαϊκών στρωμάτων στα ενεργειακά αγαθά καθώς και ο κίνδυνος διόγκωσης του κόστους ηλεκτροπαραγωγής σε βαθμό που όποια προσπάθεια οικονομικής ανάκαμψης θα σκοντάφτει στον ενεργειακό κόστος. Θέλοντας να συμβάλουμε στη διαμόρφωση μιας στρατηγικής αντίστασης στα παραπάνω, οφείλουμε πρώτα να ξεκαθαρίσουμε μια σειρά θέματα που αφορούν αυτό το ενεργειακό αγαθό. Η ηλεκτρική ενέργεια είναι ζωτικής σημασίας για τη σύγχρονη κοινωνία και αποτελεί ανεκτίμητο αγαθό για την ίδια την ανθρώπινη ζωή. Η μετατροπή του αυτού του κοινωνικού αγαθού σε εμπόρευμα, η συνακόλουθη κερδοσκοπία και η διαμορφούμενη ενεργειακή πενία πλατιών στρωμάτων του πληθυσμού, συνιστά έγκλημα κατά του λαού. Πρέπει να γίνει κατανοητό σε όλους ότι το αγαθό αυτό κοστίζει. Οι ενεργειακοί πόροι είναι περιορισμένοι και δεν είναι ανεξάντλητοι. Είναι ουτοπικό να διατείνεται κανείς ότι η διάθεση της ΗΕ μπορεί να γίνεται δωρεάν. Πρέπει να γίνεται στην τιμή κόστους, πλέον μιας πρόβλεψης για αναγκαίες επενδύσεις που θα βασίζονται στις μελλοντικές ανάγκες της κοινωνίας. Οι εταιρίες ΗΕ δεν πρέπει και δεν μπορεί να είναι κερδοσκοπικές επιχειρήσεις. Ταυτόχρονα, όμως, πρέπει να λειτουργούν με τρόπο ορθολογικό, διαφανή και απόλυτα ελεγχόμενο. Οι εταιρίες ΗΕ πρέπει να υπάγονται σε έναν κεντρικό ενεργειακό σχεδιασμό. Η λειτουργία τους είναι τόσο πολύπλοκη και πολυπαραμετρική που οποιοιδήποτε ισχυρισμοί περί “αυτοδιαχείρισης” ή “αυτόνομων ενεργειακών χώρων” κλπ είναι ουτοπικοί, εσφαλμένοι και αδυνατούν να εξασφαλίσουν ενεργειακή αυτάρκεια στο λαό. Το ενεργειακό αγαθό πρέπει να αντιμετωπίζεται ως πολύτιμος φυσικός πόρος και ως βασικός πυλώνας ανάπτυξης της οικονομίας της χώρας. Ως τέτοιο, απαιτεί απόλυτα ορθολογική μεταχείριση και πρέπει να καταναλώνεται με φειδώ. Η παραγωγή της ΗΕ πρέπει να σέβεται απόλυτα το περιβάλλον, την ιδιαίτερη αρχιτεκτονική και την ιστορία του κάθε τόπου. Το ενεργειακό αγαθό δεν μπορεί να αφήνεται έρμαιο της “ελεύθερης αγοράς”, η λειτουργία της οποίας προϋποθέτει διαρκή αύξηση της ζήτησης που οδηγεί στην κατασπατάληση ενέργειας, στην υλοποίηση μη βιώσιμων επενδύσεων και τελικά στην κερδοσκοπία. Το παράδειγμα της Ελλάδας είναι από τα πλέον αποκαλυπτικά σε όλο τον κόσμο. H παραγωγή ΗΕ με εγγυημένες τιμές από ΑΠΕ είναι μια μορφή ανακατανομής εισοδήματος υπέρ των πλουσίων: τη στιγμή που ο φτωχός δυσκολεύεται να πληρώσει το λογαριασμό του ρεύματος, ο εύπορος που έχει πρόσβαση στον τραπεζικό δανεισμό επενδύει π.χ. σε μια ασήμαντη μονάδα 10kW Φ/Β και μετακυλύει το κόστος απόσβεσης της επένδυσής του στον υπερχρεωμένο φτωχό. Αυτό είναι ανήθικο, κοινωνικά άδικο και πρέπει να σταματήσει. Οι ΑΠΕ δεν είναι ούτε μπορούν να γίνουν ο βασικός πυλώνας ανάπτυξης και χάραξης ενεργειακής πολιτικής. Πολύ περισσότερο δε μπορούμε να μιλάμε για ηλεκτροπαραγωγή αποκλειστικά από ΑΠΕ, τουλάχιστον μέχρι να ανακαλυφθούν τεχνικά βιώσιμοι τρόποι αποθήκευσης της ΗΕ. Η στοχαστικότητα της παραγωγής του τις καθιστά αναξιόπιστες. Επιπλέον, επιβάλει την εγκατάσταση ευέλικτων συμβατικών σταθμών ηλεκτροπαραγωγής – τεχνολογικά τέτοιοι είναι μόνο οι σταθμοί ΦΑ – που αυξάνουν το κόστος για το κοινωνικό σύνολο και την ενεργειακή εξάρτηση της χώρας. Δεν πρέπει να ξεχνάμε ότι στην ΕΕ η “πράσινη ανάπτυξη” ήταν ο πολιορκητικός κριός της απελευθέρωσης της αγοράς. Η χρήση των ΑΠΕ μπορεί και πρέπει να είναι μια βασική παράμετρος εξοικονόμησης ενέργειας – ιδιαίτερα σε χώρες σαν την Ελλάδα. Μόνο η ορθολογική χρήση των συμβατικών καυσίμων με αυστηρούς περιβαλλοντικούς και άλλους περιορισμούς σε συνδυασμό με τις ΑΠΕ μπορεί να εξασφαλίσει την ενεργειακή αυτάρκεια σε ένα λογικό κόστος. Στις παρούσες συνθήκες ιμπεριαλιστικής παγκοσμιοποίησης οποιαδήποτε πρόταση δήθεν διαχείρισης της ενεργειακής κρίσης που έρχεται είναι εξωπραγματική και πλαστή. Ειδικά για το χώρο της ενέργειας, ο ρόλος της ΕΕ είναι ξεκάθαρος και δεν μπορεί να αλλάξει. Η ΗΕ δεν μπορεί να αποτελέσει κοινωνικό αγαθό και δεν μπορεί να υπάρξει δημόσια ελεγχόμενη ηλεκτροπαραγωγή σε συνθήκες της ευρωπαϊκής ενοποίησης, ιδιαίτερα για μια χώρα όπως η Ελλάδα που είναι σε μεγάλο βαθμό ενεργειακά εξαρτημένη. Είναι δεδομένο ότι σε περίπτωση που ολοκληρωθεί η πώληση της ΔΕΗ, μόνο η επανεθνικοποίησή της θα μπορέσει να διαφυλάξει τα λαϊκά συμφέροντα και την ανάπτυξη της χώρας. Είναι δεδομένο, επίσης, ότι τα τιμολόγια ηλεκτρισμού πρέπει να παραμείνουν στον έλεγχο του κράτους, οι κάθε είδους πλάγιες επιδοτήσεις προς τους ιδιώτες πρέπει να σταματήσουν και ότι όλες οι συμβάσεις ΑΠΕ και οι εγγυημένες τιμές τους θα πρέπει να καταγγελθούν. Θα πρέπει να γίνει αυστηρός έλεγχος και συνακόλουθο “κούρεμα” των τραπεζικών δανείων που χρηματοδότησαν τη δημιουργία της φούσκας των ΑΠΕ. Έτσι σταδιακά θα επέλθει η επανακρατικοποίηση του συνόλου των μονάδων ηλεκτροπαραγωγής, μικρών και μεγάλων. Πρέπει να ακολουθηθούν πολιτικές απεξάρτησης της ηλεκτροπαραγωγής από το ΦΑ. Αυτή η χρήση του ΦΑ είναι ανορθολογική και σπάταλη: ο μέγιστος βαθμός απόδοσης ενός σύγχρονου αεριοστροβίλου δεν ξεπερνά το 50%. Στις απώλειες αυτές θα πρέπει να προστεθούν και οι απώλειες μεταφοράς της ΗΕ στο δίκτυο. Αντίθετα, η καύση ΦΑ για θέρμανση ή στα νοικοκυριά έχει βαθμό απόδοσης σχεδόν 100%. Η ηλεκτροδότηση της χώρας πρέπει να εξασφαλιστεί με την καύση λιγνίτη – ως βασικού “εθνικού” καυσίμου – πράγμα που σημαίνει ότι ο εκσυγχρονισμός των υφιστάμενων λιγνιτικών μονάδων πρέπει να είναι πρωταρχικής σημασίας. Μια σύγχρονη λιγνιτική μονάδα μπορεί να έχει βαθμό απόδοσης άνω του 40% (σε αντίθεση με το 20-25% της πλειοψηφίας των σημερινών μονάδων ενώ η εκλυόμενη θερμότητα μπορεί να στηρίξει με θερμικό φορτίο τοπικές κοινωνίες ή ενεργοβόρες βιομηχανίες. Ο λιγνίτης ως καύσιμο υπάρχει σε μεγάλη αφθονία στη χώρα ενώ σημαντικότατα ανεκμετάλλευτα κοιτάσματα υπάρχουν στην περιοχή της Ελασσόνας και της Δράμας. Εκτιμάται ότι τα αποθέματα αυτά μπορούν να ηλεκτροδοτούν τη χώρα για περισσότερο από 45 χρόνια, ακόμα και αν ο ρυθμός αύξησης της ζήτησης συνεχίζονταν με τα προ της κρίσης επίπεδα7. Συμπληρωματικά, εξασφαλίζοντας μεγάλη εξοικονόμηση ορυκτού καυσίμου πρέπει να αξιοποιηθούν οι ΑΠΕ όχι ως ένας μηχανισμός εξασφάλισης σίγουρου κέρδους αλλά ενταγμένες σε ένα ευρύτερο πρόγραμμα αξιοποίησης του υδρολογικού δυναμικού (αντλιοταμίεση, υβριδική λειτουργία υδροηλεκτρικών και ΑΠΕ). Οι τεχνικές δυνατότητες είναι πλέον πραγματικές και τα οικονομικά οφέλη τεράστια. Βασική παράμετρος πρέπει να είναι η εξοικονόμηση ενέργειας μέσα από την υποχρεωτική εγκατάσταση κεντρικών ηλιακών συστημάτων σε κάθε νέα οικοδομή καθώς και με την υλοποίηση εφαρμογών μικροδικτύων, η ανάπτυξη των οποίων αναμένεται να γίνει εμπορικά εκμεταλλεύσιμη την επόμενη δεκαετία. Έτσι, οι ΑΠΕ μπορούν να εισαχθούν σε μεγάλο βαθμό στον αστικό ιστό (Φ/Β στοιχεία ενσωματωμένα στα δομικά στοιχεία κτιρίων, στις οροφές εγκαταλειμμένων εγκαταστάσεων κλπ). Με εφαρμογές μικροστροβίλων (ισχύος μερικών watt) μπορεί να γίνει εξοικονόμηση ενέργειας στο κάθε νοικοκυριό. Πρέπει να δοθούν κίνητρα στους πολίτες για την ενσωμάτωση τέτοιων διατάξεων τα οποία θα μπορούσαν να είναι φοροαπαλλαγές και η εφαρμογή της αρχής του συμψηφισμού: μείωση ή και απαλλαγή από το κόστος ρεύματος σε αντάλλαγμα για την έγχυση ενέργειας στο επίπεδο της χαμηλής τάσεως. Η εγκατάσταση Φ/Β σε αρόσιμη γη πρέπει να απαγορευθεί. Αντίθετα, μπορεί και πρέπει να ενταθεί η ένταξη Φ/Β σε πολύ μικρά νησιά του Αιγαίου τα οποία, τους θερινούς μήνες, μπορούν να εξασφαλίσουν ως και απόλυτη ενεργειακή κάλυψη. Η αιολική ενέργεια μπορεί και πρέπει να αξιοποιηθεί με την ανάπτυξη υποθαλάσσιων διασυνδέσεων σε επιλεγμένες βραχονησίδες, όπου η αισθητική και περιβαλλοντική όχληση είναι μικρότερη. Ο συντελεστής χρησιμοποίησης (capacity factor) των θαλάσσιων Α/Π ξεπερνά το 40% (σε σύγκριση με το <30 7=»» lang=»en-US» span=»»>MW ανά πύργο, σε σύγκριση με τα 3,0 ΜW σε εφαρμογές στη στεριά, ενώ η τεχνολογία τους εξελίσσεται διαρκώς. Με λιγότερους πύργους μπορεί να επιτευχθεί καλύτερο αποτέλεσμα με μικρότερη όχληση. Τέλος, πρέπει να διερευνηθεί η συμμετοχή της Ελλάδας στους μηχανισμούς εμπορίας αερίων ρύπων. Χωρίς να αμφισβητεί κανείς την κλιματική αλλαγή, είναι ένα ζητούμενο κατά πόσο αυτή μπορεί να αποδοθεί αποκλειστικά στην χρήση του άνθρακα στην ηλεκτροπαραγωγή 8. Παρόλα αυτά, οι μηχανισμοί αγοράς που έχουν δημιουργηθεί απλά μετατοπίζουν το πρόβλημα στις χώρες της περιφέρειας τη στιγμή που οι ενεργειακοί κολοσσοί που εμπορεύονται τα πράσινα πιστοποιητικά συμβάλλουν όσο κανένας άλλος στην υπερθέρμανση του πλανήτη (π.χ. Shell). Προϋπόθεση για τα παραπάνω, είναι η ύπαρξη κοινωνικών κινημάτων προάσπισης και ανάδειξης των δημόσιων αγαθών που δεν μπορεί και δεν πρέπει να περιορίζονται στα πλαίσια της ριζοσπαστικής αριστεράς. Οι οργανωμένες δυνάμεις της αριστεράς όχι μόνο δε φτάνουν για το μέγεθος και τη σπουδαιότητα του επίδικου αλλά δυστυχώς δε μπορούν να θέσουν απλά ερωτήματα στον ελληνικό λαό, όπως “ τι σημαίνει Δημόσιο Κοινωνικό Αγαθό και σε τι διαφέρει από ένα απλό εμπόρευμα ή μια υπηρεσία επ’ αμοιβή”. Η προάσπιση του δημόσιου αγαθού της ενέργειας – και όχι της ΔΕΗ με την έννοια μιας κρατικής εταιρίας – πρέπει να γίνει υπόθεση όλου του λαού. Τα πράγματα γίνονται πιο δύσκολα με τη διάλυση του συνδικαλιστικού κινήματος που καθιστά αμφίβολη την όποια προσπάθεια αντίδρασης στο εσωτερικό της ΔΕΗ Α.Ε. Αξίζει να αναφερθεί η αδράνεια της ΓΕΝΟΠ στις επερχόμενες αλλαγές, αποτέλεσμα του χρόνιου συντεχνιασμού, της ώσμωσής της με τις εκάστοτε διοικήσεις και της απονομιμοποίησής της στα μάτια της κοινωνίας. Τα οικονομικά σκάνδαλα που αφορούσαν χρηματοδότηση δραστηριοτήτων της ΓΕΝΟΠ από την ίδια τη ΔΕΗ Α.Ε. – χρήματα το ύψος των οποίων και το που πραγματικά διατέθηκαν κανείς δεν ξέρει το ξέρει – έχουν αναστείλει κάθε δραστηριότητα της ομοσπονδίας. Η κατάσταση αυτή, βέβαια, διευκολύνει παρατάξεις που έμμεσα έχουν αποδεχθεί την ιδιωτικοποίηση σαν μια πραγματικότητα (ΔΑΚΕ και επίσημη ΠΑΣΚ). Η στάση της ΕΑΜΕ (Φωτόπουλος) δεν είναι ούτε ενιαία ούτε σταθερή. Αν και διακηρυκτικά τάσσεται υπέρ κινητοποιήσεων, δεν φαίνεται να έχει δύναμη να κινητοποιήσει κόσμο ενώ στελέχη της εξακολουθούν να ωσμώνονται με το επίσημο ΠΑΣΟΚ – δέσμια συντεχνιακών ή άλλων προσωπικών συμφερόντων. Οι δυνάμεις της αριστεράς, μικρές και διασπασμένες χωρίς ουσιαστική παρέμβαση στους πραγματικά μαζικούς χώρους της εταιρίας που είναι οι ενώσεις των τεχνικών και τα ορυχεία. Η χρόνια κακοδιαχείριση της ΔΕΗ – που περνούσε μέσα και από την ανοχή και στήριξη της ΓΕΝΟΠ – έχουν φθείρει σε μεγάλο βαθμό την εικόνα της στην κοινωνία. Στην ίδια την εταιρία έχει δημιουργήσει μια υδροκέφαλη, αδιαφανή και ανορθολογική λειτουργία (ενδεικτικά, το 40% των εργαζομένων έχουν κάποιο βαθμό ιεραρχίας που τους διαφοροποιεί από τους υπόλοιπους εργαζομένους. Στους μηχανικούς το ποσοστό αυτό φτάνει μέχρι και το 60%) ! Αυτό συνοδεύεται από αντίστοιχα οικονομικά επιδόματα, δημιουργεί στεγανά, διευθύνσεις που αλληλοκαλύπτονται κλπ κλπ. Όχι μόνο αυξάνει το λειτουργικό κόστος αλλά συμβάλλει στην αδιαφάνεια, τη δυσλειτουργία και στην αδράνεια όλου του μηχανισμού. Παρόλα αυτά, η ευρωπαϊκή εμπειρία καταγράφει συνεχείς εξελίξεις υπέρ του δημόσιου και κοινωνικού χαρακτήρα των υπηρεσιών κοινής ωφέλειας. Οι πρωτοβουλίες αυτές για την ώρα περιορίζονται στο χώρο της ύδρευσης και αποχέτευσης και αφορούν τη διοργάνωση άτυπων «κοινωνικών διαβουλεύσεων» κατά μιας συγκεκριμένης ιδιωτικοποίησης (π.χ. consulta social» κατά της ιδιωτικοποίησης του νερού στη Μαδρίτη), τη διεξαγωγή επίσημων δημοψηφισμάτων με δεσμευτικό αποτέλεσμα για τις εθνικές και τοπικές κυβερνήσεις (π.χ. Ιταλία, Γερμανία) μέχρι και την ανάκτηση από το δημόσιο επιχειρήσεων και υποδομών που είχαν παραχωρηθεί σε ιδιώτες (Γαλλία, Γερμανία). Η παρέμβαση της Αριστεράς πρέπει να ακολουθήσει αυτή την τακτική – του ανοίγματος στην πραγματική κοινωνία και της διαμόρφωσης μιας αντίστοιχης κοινωνικής συνείδησης για τα λαϊκά αγαθά και δικαιώματα. Χωρίς τη διαμόρφωση μιας τέτοιας συνείδησης, εργατικίστικες τακτικές και οραματισμοί συμβουλίων εργαζομένων που θα πάρουν τις τύχες στα χέρια τους κλπ είναι ουτοπικές. Η εμπειρία από τα κοινωνικά συμβόλαια των περασμένων δεκαετιών που εξέθρεψαν μια κακώς νοούμενη δημοσιοϋπαλληλική νοοτροπία – ο χώρος της ΔΕΗ ήταν από τα χαρακτηριστικά παραδείγματα – είναι ακόμα νωπή. Αντίθετα, η Αριστερά πρέπει να πρωτοστατήσει στην οργανωτική ανασυγκρότηση του συνδικαλισμού στο χώρο της ΗΕ με τη δημιουργία πρωτοβάθμιων σωματείων ανά χώρο ή και κλάδο δουλειάς και όχι ανά ειδικότητα. Ενιαία Σωματεία στα οποία θα μετέχουν και το διοικητικό προσωπικό και οι τεχνικοί και οι μηχανικοί, που θα έχουν ένα μέσο μέγεθος που θα διευκολύνει τις μαζικές διαδικασίες, που θα είναι συγκεντρωμένα τοπικά και όχι διάσπαρτα σε όλη την επικράτεια. Το βήμα αυτό, αν και δύσκολο είναι πραγματικά αναγκαίο. Ίσως η παρούσα κρίση, και η de jure διάσπαση της ΔΕΗ να είναι και μια ευκαιρία για την ανασυγκρότηση του συνδικαλιστικού κινήματος. Το Δ’ Τμήμα του Αρείου Πάγου, δικάζοντας σε συμβούλιο, εξέδωσε την υπ. αριθμ. 227/2012 απόφαση, με την οποία έκανε δεκτή την αίτηση αναστολής του υπουργού Οικονομικών σχετικά με την είσπραξη του ειδικού τέλους μέσω της ΔΕΗ. Το Ανώτατο Δικαστήριο έκρινε ότι για λόγους δημοσίου συμφέροντος και προκειμένου το Δημόσιο να μην υποστεί σημαντική βλάβη στα έσοδα του και να μην τεθεί σε σοβαρό κίνδυνο η επίτευξη των δημοσιονομικών στόχων από τη μη είσπραξη του τέλους, η ΔΕΗ οφείλει να συνεχίσει να εισπράττει το τέλος ηλεκτροδότησης μέσω των λογαριασμών της. Στο διατακτικό της απόφασης [PDF], παρ’ όλα αυτά, επισημαίνεται ότι η ΔΕΗ οφείλει να μη διακόπτει την παροχή ρεύματος στους καταναλωτές, οι οποίοι αδυνατούν να καταβάλουν το τέλος, μέχρι να εκδοθεί απόφαση επί των αιτήσεων αναιρέσεως. Τέλος, σημειώνεται ότι η δικάσιμος για την εκδίκαση των τελευταίων έχει οριστεί για τις 22 Μαρτίου 2013. Την γνώμη μου και τις θέσεις μου αλλά και τους προβληαμτισμούς μου για τα ζητήματα των ΑΠΕ, των α/π, των α/γ και των φωτοβολταϊκών και εν γένει της ενέργειας έχω σε γενικές γραμμές δουλέψει στα ιστολογια http://sdappe-kimis.pblogs.gr/ και http://epppo.pblogs.gr/. Σοβαρές κατηγορίες σε βαθμό κακουργήματος αντιμετωπίζουν 11 άτομα μετά τις καταγγελίες περί υπεξαίρεσης 120 εκατ. ευρώ από ιδιώτες παρόχους ηλεκτρικής ενέργειας. Η Εισαγγελία άσκησε χθες ποινική δίωξη εναντίον πέντε εκπροσώπων των εταιρειών Energa και Hellas Power, καθώς και έξι εκπροσώπων του Διαχειριστή Ελληνικού Συστήματος Μεταφοράς Ηλεκτρικής Ενέργειας. Η δίωξη αφορά τα αδικήματα της υπεξαίρεσης εις βάρος του Δημοσίου και της απιστίας στην υπηρεσία, σε συνδυασμό με τον νόμο περί καταχραστών δημοσίου χρήματος. Ηδη, απαγορεύθηκε η έξοδος από τη χώρα σε πέντε από τους κατηγορουμένους, ενώ ετέθη στο αρχείο το σκέλος που αφορούσε τυχόν παραλείψεις της Ρυθμιστικής Αρχής Ενέργειας. Ένα νέο ενεργειακό κέντρο με συνολική ισχύ άνω των 7.300 ΜW, δηλαδή σχεδόν δύο φορές μεγαλύτερο από αυτό στη Δυτική Μακεδονία, σχηματίζεται στην Ανατολική Στερεά, την Εύβοια, την Κορινθία και τη Μαγνησία. Αποτέλεσμα αυτής της υπερσυγκέντρωσης σταθμών ηλεκτροπαραγωγής είναι οργανώσεις πολιτών να αντιδρούν για τις περιβαλλοντικές επιπτώσεις των νέων μονάδων, εκ των οποίων πολλές θα κατασκευασθούν σε ήδη επιβαρημένες περιοχές. Ειδικότερα, από το σύνολο των 7.380 ΜW τα 2.060 ΜW αφορούν σε νέες λιθανθρακικές μονάδες που αναμένεται να εγκατασταθούν στο Αλιβέρι και το Μαντούδι Εύβοίαςκαθώς και τη Λάρυμνα Φθιώτιδας, ενώ τα υπόλοιπα σε μονάδες φυσικού αερίου στην Εύβοια, τη Βοιωτία, την Αττική, την Κορινθία και τη Μαγνησία. Την ίδια ώρα, έχει δρομολογηθεί παύση λειτουργίας σταθμών συνολικής ισχύος 930 ΜW – εκ των οποίων τα 180 με φυσικό αέριο- στην Αττική και στο Αλιβέρι έως το 2015. Όσον αφορά στους νέους λιθανθρακικούς σταθμούς, το WWF Ελλάς υπολογίζει ότι πέρα από τους 11,4 εκατομμύρια τόνους διοξειδίου του άνθρακα που θα συνεισφέρουν στο φαινόμενο του θερμοκηπίου ετησίως, θα απελευθερώνουν πάνω από 8.500 τόνους διοξειδίου του αζώτου, 4.800 τόνους διοξειδίου του θείου και περίπου 900 τόνους αιωρούμενων μικροσωματιδίων (οι τρεις τελευταίοι ρύποι συνδέονται με αναπνευστικά προβλήματα και φωτοχημικό νέφος). Όπως δε αναφέρει η περιβαλλοντική οργάνωση, οι προηγούμενες εκτιμήσεις αποτελούν το καλύτερο δυνατό σενάριο, σαφώς η εμπειρία έχει δείξει ότι οι πραγματικές εκπομπές είναι κατά πολύ περισσότερες σε σχέση με τις εργοστασιακές προδιαγραφές λόγω της ποιότητας του καυσίμου, τις βλάβες του εξοπλισμού κ.λπ. «Στους παραπάνω ρύπους δεν υπολογίζεται η επιβάρυνση του περιβάλλοντος λόγω παραγωγής βαρέων μετάλλων, στερεών και ραδιενεργών αποβλήτων καθώς και θαλασσινού νερού», επισημαίνει το WWF. Μάλιστα, ο ΟΟΣΑ αναφέρει σε έκθεσή του (Ιnternational Εnergy Τechnology, Collaboration and Climate Change Μitigation, 2005) ότι η καύση λιθάνθρακα εκπέμπει αιωρούμενα σωματίδια, οξείδια αζώτου και θείου, υδράργυρο και άλλα μέταλλα περιλαμβανομένων και μερικών ραδιενεργών στοιχείων σε πολύ μεγαλύτερες ποσότητες απ΄ ό,τι το πετρέλαιο ή το φυσικό αέριο, προκαλώντας έτσι τοπικά και περιφερειακά προβλήματα μόλυνσης». Ενδεικτικά, για τη λειτουργία της λιθανθρακικής μονάδας στο Μαντούδι Ευβοίας με ισχύ 460 ΜW θα χρειάζονται ετησίως 560 εκατομμύρια κυβικά μέτρα νερού για την ψύξη των μηχανών, το οποίο θα επιστρέφει στη θάλασσα σε υψηλές θερμοκρασίες. «Στο Αλιβέρι, σε μία περιοχή ήδη επιβαρημένη από την ανεξέλεγκτη λειτουργία τσιμεντοβιομηχανίας και μονάδας παραγωγής ηλεκτρισμού με μαζούτ ξαφνικά, πέρα από τον σταθμό φυσικού αερίου, προέκυψε και το σχέδιο κατασκευής μονάδας λιθάνθρακα και μάλιστα σε κτήμα που ανήκει στον Δήμο Ταμυναίων. Αυτά τα σχέδια έχουν αναστατώσει τους κατοίκους, που ήδη διαμαρτύρονται για τη φονική ατμοσφαιρική ρύπανση στο Αλιβέρι και είναι αποφασισμένοι να αντισταθούν στην κατασκευή του. Μέχρι στιγμής τρεις γειτονικοί δήμοι και 20 οργανώσεις αντιτίθενται στα σχέδια της ΔΕΗ», αναφέρει η κ. Δέσποινα Μαρίνου από την Ένωση Ταμυναίων Πολιτών «Παρέμβαση» και εκπρόσωπος στην Πανελλαδική Πρωτοβουλία ενάντια στον Λιθάνθρακα. Στο μέτωπο των νέων σταθμών φυσικού αερίου, το μεγαλύτερο βάρος αναμένεται να «σηκώσει» η Βοιωτία, καθώς περίπου 2.700 ΜW αναμένεται να εγκατασταθούν στον συγκεκριμένο νομό. Και μπορεί οι εκπομπές του διοξειδίου του άνθρακα να είναι μειωμένες κατά το ένα τρίτο σε σχέση με την αντίστοιχη ισχύ λιθανθρακικών μονάδων, ωστόσο επικρατεί έντονος προβληματισμός για τις εκπομπές οξειδίων του αζώτου (ΝΟx), τα οποία προκαλούν αναπνευστικά προβλήματα και φωτοχημικό νέφος. Υπολογίζεται δε ότι αν οι σταθμοί λειτουργούν κατά τα 2/3 του έτους, μόνο στη Βοιωτία θα εκλύονται πάνω από 4.000 τόνοι ΝΟx. Αμέσως μετά τη Βοιωτία έρχεται η Αττική, όπου από τα 1385 ΜW νέων μονάδων φυσικού αερίου θα εκλύονται επιπλέον 2100 τόνοι οξειδίων του αζώτου, και ακολουθούν Εύβοια, Κορινθία και Μαγνησία όπου θα δημιουργηθούν 3 νέες μονάδες ισχύος 400 ΜW έκαστη. «Ο νομός Βοιωτίας αναμένεται να νεκρώσει και όχι απλά να επιβαρυνθεί από τη λειτουργία των νέων μονάδων φυσικού αερίου. Επιπλέον, αν και ο επενδυτής του λιθανθρακικού σταθμού 600 ΜW στα Άσπρα Σπίτια εξέφρασε την άποψη ότι μάλλον δεν θα προχωρήσει, ωστόσο δεν έχει αποσύρει την αίτηση, η οποία σημειώνεται πως έχει ήδη λάβει θετική γνωμοδότηση», λέει ο Τάσος Κεφαλάς από τη Συμπαράταξη Βοιωτών. «Ήδη στον νομό λειτουργούν τρεις βιομηχανικοί πόλοι- σε Οινόφυτα, Θίσβη και Αντίκυρα- που προκαλούν μεγάλη περιβαλλοντική επιβάρυνση στην περιοχή. Μάλιστα στη Θίσβη, η βιομηχανική περιοχή λειτουργεί εδώ και 8 χρόνια ενώ τώρα κατασκευάζονται οι υποδομές… Και ενώ υπάρχουν οι άδειες για 8 νέους σταθμούς φυσικού αερίου εκδηλώνεται ενδιαφέρον για την κατασκευή ακόμα περισσότερων, γεγονός που σε συνδυασμό με τη μελλοντική επέκταση και την ενοποίηση της βιομηχανικής ζώνης με τη Λαμία σηματοδοτεί την πλήρη βιομηχανοποίηση του νομού μας. Πρόκειται για μία βίαιη μετατροπή του χαρακτήρα της περιοχής, που συνδύαζε τη βιομηχανία με τις αγροτικές δραστηριότητες και τον τουρισμό», συμπληρώνει ο κ. Κεφαλάς. ΑΝΤΙΔΡΑΣΕΙΣ εκφράζουν και οι κάτοικοι του ήδη επιβαρημένου Θριασίου Πεδίου και της Ελευσίνας, όπου σχεδιάζεται μονάδα φυσικού αερίου ισχύος 880 ΜW. «Είναι παράλογα αυτά τα σχέδια για το κορεσμένο βιομηχανικά Θριάσιο. Πρόκειται για τη μεγαλύτερη μονάδα φυσικού αερίου στην Ελλάδα, η οποία επιχειρείται να «στηθεί» πάνω σε μπαζωμένη με σκουριές και απόβλητα θαλάσσια έκταση, και μάλιστα σε ελάχιστη απόσταση από τους οικισμούς. Πέρα από την επιπλέον ατμοσφαιρική ρύπανση αναμένεται να υπάρξει και θαλάσσια ρύπανση σε έναν κόλπο ο οποίος, παρά την επιβαρημένη περιβαλλοντικά κατάστασή του, τα τελευταία χρόνια έχει παρουσιάσει σημάδια βελτίωσης», λέει ο κ. Χρήστος Χρηστάκης, μέλος της Επιτροπής Αγώνα κατά των επεκτάσεων της Πετρόλα και των μονάδων ηλεκτροπαραγωγής της Χαλυβουργικής. «Κατά συνέπεια μιλάμε για ένα τρομερό πισωγύρισμα που η τοπική κοινωνία δεν μπορεί να ανεχθεί. Όσο γρηγορότερα εγκαταλειφθούν αυτά τα σχέδια τόσο μεγαλύτερο θα είναι το κέρδος και της Χαλυβουργικής και της ΔΕΗ», τονίζει. Με περικοπές ρεύματος σχεδιάζει να καλύψει η ΔΕΗ το έλλειμμα ισχύος 1.200 ΜW που αναμένεται να δημιουργηθεί τις ώρες αιχμής του φετινού καλοκαιριού. Το μέγεθος του ελλείμματος θεωρείται πολύ υψηλό και ενδέχεται να οδηγήσει ακόμα και σε καθημερινές παρατεταμένες διακοπές ρεύματος. H αδιάλειπτη λειτουργία των κλιματιστικών, που εκτιμάται ότι ανεβάζει την αιχμή κατά 2.500 MW, αποτελεί και για φέτος τη μεγάλη απειλή του οριακού, από άποψη παραγωγής και μεταφοράς ενέργειας, ηλεκτρικού συστήματος της χώρας. Σε σχέση με πέρυσι η ζήτηση αναμένεται στις αιχμές αυξημένη κατά 400 MW και θα προέρχεται εξ ολοκλήρου από τη λειτουργία πρόσθετων κλιματιστικών μηχανημάτων. Αυτό που φοβούνται στον ΔEΣMHE και στη ΔEH είναι ότι η ζήτηση θα ξεπεράσει τα 10.500 MW ακόμη και με θερμοκρασίες που δεν θα ξεπερνούν τους 40 βαθμούς Κελσίου. Είναι χαρακτηριστικό το γεγονός ότι με τις πρώτες υψηλές θερμοκρασίες της περασμένης Tετάρτης και Πέμπτης, η ζήτηση αυξήθηκε κατακόρυφα στα 9.100 και 9.500 MW αντίστοιχα, κάτι το οποίο προδιαθέτει για τα μελλούμενα. Για για τη μέγιστη δυνατή ανταπόκριση του συστήματος, από πλευράς του ΔEΣMHE έχουν διασφαλιστεί εισαγωγές ενέργειας 600 MW περίπου από τα βόρεια σύνορα, ενώ καθημερινά θα υπάρχει επικοινωνία με τις αρχές της Aλβανίας και των Σκοπίων για τη δυνατότητα πρόσθετης ενέργειας 200 MW, η οποία θα εξαρτηθεί από την εξέλιξη της ζήτησης στις δύο χώρες. Iσχύς 400-500 MW θα μπαίνει στο σύστημα μέσω και της ηλεκτρικής διασύνδεσης με την Iταλία.